We are back from a fun weekend in Alabama with Ben's family! G was a trooper on the ride down there. He only slept for 30 minutes, but he loves looking out the window now & shouting "truck!" (his version, anyway) when we pass big rigs. 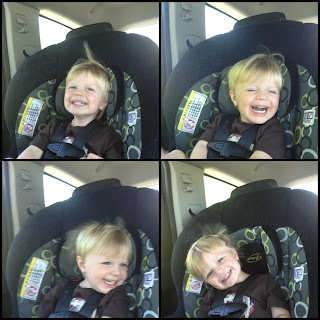 Grayson loves the new SUV because it has an air vent right above his head. Of course, he wants it to BLAST on him at all times. He was cracking up when I cranked the air on our way down! We got there on Friday afternoon just in time to watch Ben's little brother play baseball. 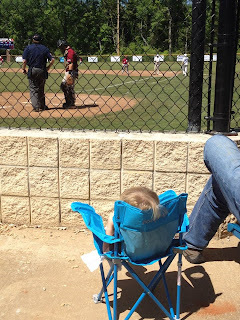 G is obsessed with any sport that involves a ball right now so we figured he would love a real baseball game. He did! He watched the game, ate a hot dog, and ran around talking to everyone. Such a people person! We brought G's tailgating chair and he sat right next to a new friend, drank his water, and watched Uncle Thomas at bat. He was such a ham! Everything was all good & dandy until bedtime on Friday. Grayson is still in a pack-n-play when we travel and after 2 hours of sleep, he decided he was not having it. He has to sleep in the room with us when we are in Alabama & my child does not cosleep. I'm pretty sure that he thinks that big beds are wrestling rings because he acts like a crazy person when he is on a bed! He flipped, flailed, and rolled around all night long. He slept for a total of 2 hours. We were all pretty miserable on Saturday morning. He ended up hating the pack-n-play all weekend; no napping in it & no sleeping. He did sleep last night with us, very squished in between. Here's my question for mamas of toddlers: What does your child sleep in/on when you travel if they are still in a crib at home but hate the pack-n-play? We are going to the beach in mid-May and I am now nervous of the sleep situation! Easter was so fun this year since Grayson is older & understanding more. We had fun filling up his Easter basket with trucks, books, bubbles, and skittles! Can you tell trucks are our favorite thing right now?! G is obsessed! Look at that sweet boy! ...let me tell you, it was SO hard to get him to stand still for this picture. It's still kind of blurry! Seriously, photographing toddlers=no easy task. I can't believe this was our last Easter as a family of 3. We will have another sweet boy to add to our picture next year! Laura~ We travel A LOT and did even more so when Sophie was little. I used to fear her not sleeping in a pack-n-play during travels, so I would have her sleep in one at home every other day for naps and leading up to a trip, occasionally at night. I use a sound machine to have some consistency at home and when we travel as well as the same blankets. That way, the only thing that's different is the bed itself. One last thing...I put an egg crate cushion under the soft fitted sheet to make it nice and soft. Sometimes their crib mattress is much softer then pack-n-plays, so this helped us with Blake! Rent a crib!! I could really eat G up...he's completely adorable...and you are GLOWING momma! You look great! Burkleigh hates her pack n play too. I did buy a mattress for it and that seemed to help her. Those things are not comfortable and I know what you mean about cosleeping. We don't do it either and it makes it hard on trips. I did set it up in her room a few days before we left and let her nap in it. Good luck!! I try to make sure I have all the same blankets, and his little bright stars aquarium projector. I also put an extra quilted blanket underneath the sheet so it is softer (but not too soft!). He still doesn't usually sleep as long when in the pack-n-play, but it is better than it used to be!